The customized Ford F150 SVT Raptor shown on the right is the newest vehicle to wear the Tanner Foust name as the Top Gear host and champion of both the drift and rally worlds grows his high performance vehicle brand – the Foust Edition. Tanner Foust is best known for his role on Top Gear America along with being a global rally racing champion and a drift champion but with the introduction of the new Foust Edition Ford F150 Raptor performance truck – Tanner Foust is quickly becoming a brand name that takes aim at some of the biggest tuner names in the US auto industry. The Foust Edition name first appeared on the new Ford Focus ST when the super tuned hot hatch debuted back at the 2012 SEMA Show but it looks like Tanner might be ready to add another vehicle to his brand lineup with the introduction of the Foust Edition Ford F150 Raptor. Tanner teamed up with the folks at LGE CTS Motorsports in San Dimas California to design a Raptor that is even more capable of taking and handing out high performance abuse. While there are plenty of custom Raptor packages on the market, none of the competition comes with Foust’s seal of approval that is backed by the experience of one of the world’s most successful offroad racers. The SVT Raptor is a truck made to go fast on even the roughest roads so it should come as no surprise that the heart of the Foust Edition Ford F150 Raptor is a substantial suspension package upgrade capped off by some heavy duty wheels and tires. First, an ICON Vehicle Dynamics 3.0 Performance Suspension Stage 2 setup adds an adjustable front coil over shock setup featuring ICON springs, an adjustable rear shock setup and billet aluminum upper control arms. The front coilover setup features both stiffness adjustments and adjustable ride height that can range from 1 to 3.5 inches of lift while the rear shocks allow for quick adjustments in stiffness with the turn of a knob. Capping off the suspension upgrades is a set of Ride-N-Tow rear leaf springs from Atlas Spring. Finally, to insure that the Foust Edition Raptor can handle any terrain, a set of 18” KMC Wheels wrapped in 35” Hankook Dynapro MT tires has been added to help make the most of the incredible suspension package. Once the suspension setup of this race-ready Foust Edition F150 Raptor has handled, the team turned to the exterior of the truck, looking to provide a more offroad friendly form while continuing the flat black theme created by the KMC wheels. LGE CTS Motorsports started by adding their Baja Forged front bumper, side bars and rear bumper with an integrated tow hitch – all of which are finished in flat black while brushed titanium finishes on the top of the side steps and the bumpers provide a touch of contrast to the blacked out treatment. In the middle of the LGE front bumper is a 30” LED light bar from KC HiLites while similar yet smaller KC LED lights are mounted in the corners of the rear bumper as well while a Street Scene Equipment rollpan painted by L&G Enterprises cleans up the look of the back end under the tubular bumper. Finally, to help improve the aerodynamics of the Foust Edition Raptor and the ability to protect things stowed in the bed, a paint matched bed cap from LEER Products has been added with the Tanner Foust Edition “TF” logos scattered along both sides of the truck on the cap, bedside, doors and fenders. The bad news – if there really is any – with the new Foust Edition Ford F150 Raptor is that this truck was built for Tanner and not as the first of a production package. I had a chance to speak with Theresa Contreras of L&G Enterprises who explained to me that Tanner came to them with the request of building a Raptor that would tackle any terrain, be able to tow and safely house his dog in the bed (hence the cap). Based on what I can see in these images, the company hit the nail on the head as this is one great looking Raptor that has everything imaginable to be an offroad monster that doesn’t lack the ability to serve as a daily driven truck – with plenty of space for a dog or two. 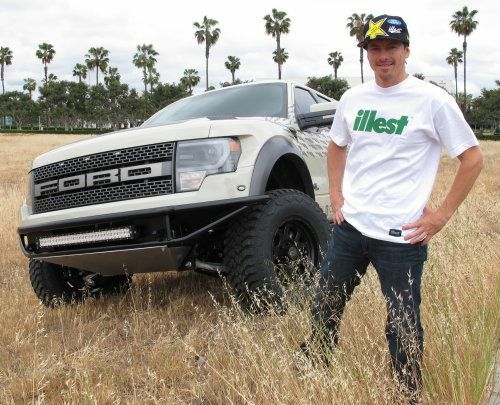 However, considering that Tanner Foust has referred to this truck on his Facebook page as being the Foust Edition Raptor and in showing off the suspension he used the Foust Edition hashtags; perhaps this is a truck that could become a production reality if there is enough interest from the Raptor and offroad truck communities. The Foust Edition Focus ST began as a SEMA Show concept car but thanks to the amount of interest in Tanner’s tuned up Focus – it became a production reality. Let’s hope that the same proves to true of the Foust Edition Raptor. Click here for a closer look at the Foust Edition Ford Focus ST!